Its next incarnation? Regional planners imagine replacing the central parking area at Shoppers World with a public green, building residential units above existing stores, and adding buildings with a mix of uses. Cars would be tucked away in a garage. Mention Route 9 to anyone who lives in the communities west of Boston, and you are likely to conjure images of motorists maneuvering through stop-and-go traffic, and executing a complex series of U-turns simply to cross the thoroughfare and get from one shop to the next. But regional planners imagine a future in which shoppers can travel from place to place on foot, bike, or public transit, with common areas where people can congregate. 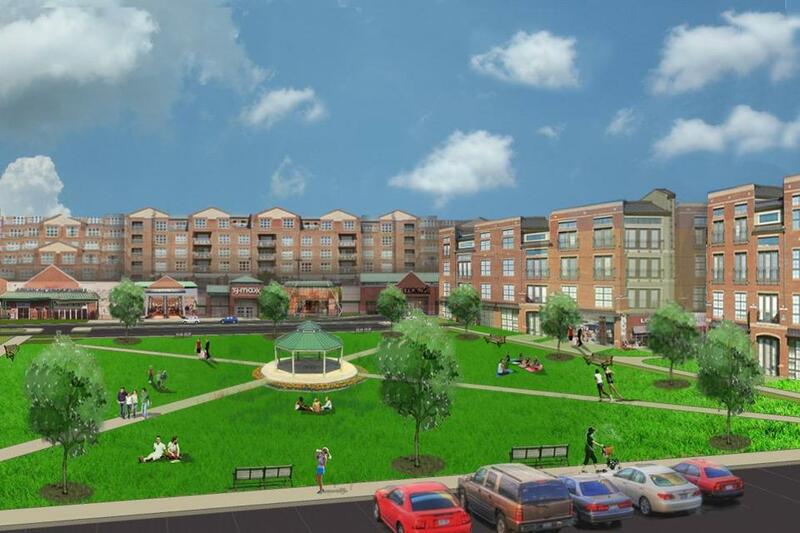 Suggestions include moving buildings closer to the street with parking in the back, eliminating sprawling parking lots in favor of compact garages and public green space, and constructing buildings that span Route 9 to create pedestrian connections. “What we’re trying to do is get people to think about developing in a different way,” said Bruce Leish, director of the MetroWest Regional Collaborative, part of the Metropolitan Area Planning Council. Built out to its current zoning, Leish said, the stretch of Route 9 from Wellesley to Southborough will eventually balloon, with development increasing by 88 percent . At the same time, he said, traffic will increase by 41 percent. Here are some smart-growth proposals for The Golden Triangle, Framingham Centre, and Fayville along Route 9. “It’s zoned, essentially, for sprawl,” Leish said. Using the principles of smart growth — a planning strategy that emphasizes compact, mixed-use development — Route 9 could still increase its current square footage by 60 percent while increasing traffic by 20 percent, Leish said. Planners focused on three areas along Route 9 for their suggestions. In the Fayville area of Southborough, they envision buildings closer to the corners of the intersection at Route 9 and Oak Hill Road, with a landscaped median to slow traffic and allow for easier pedestrian crossing. In the Framingham Centre historic area near Framingham State University, planners propose reducing the number of access roads and parking lots, and replacing pavement with retail space to create a shopping village. Perhaps the most dramatic reenvisioning is reserved for the “Golden Triangle,” the crowded commercial area that stretches for nearly 2 miles between the Speen Street interchange in Natick and Route 30 in Framingham. In addition to constructing buildings across Route 9 and moving shops closer to the road in Natick, planners imagine moving cars off of the existing massive parking lot at Shoppers World in Framingham. The lot would be replaced with a public green and a compact garage with retail space on the ground floor. Additionally, smaller shops and residential space would be built above and beside the mall’s big-box stores. “We’re trying to animate Shoppers World,” Leish said. Bonnie Biocchi, president and chief executive of the MetroWest Chamber of Commerce, said there might be a disconnect between what planners want for the region and what makes business sense. “Sometimes we have these great visions, but in reality they’re not as easy to implement,” Biocchi said. For example, Biocchi said, she is skeptical about the viability of residential units mixed in with retail space. The Nouvelle at Natick condo development at Natick Mall was largely seen as a flop, with units selling for huge discounts off their initial listing prices. Biocchi also said that, while she sometimes finds crossing Route 9 hectic, it is impractical to wish away traffic. But Leish defended the concept of a mix of residential and retail space. And Leish said he merely wants to make life easier for pedestrians, not eliminate cars. Leish lives about a mile from Shoppers World and walks in the area, but said it is difficult. Leish acknowledged that his agency’s plans are long term. And, although developers were asked for input, he said, planners were unable to talk to some current landowners. Officials at DDR Corp., the Beachwood, Ohio-based real estate company that owns Shoppers World, did not return a call seeking comment. While many of the proposed changes are dramatic, there is a precedent for seismic shifts along Route 9. Before Shoppers World was made into the U-shaped haven for big-box stores that it is today, it featured two levels of shops surrounding an open courtyard and connected by walkway bridges. Michelle McElroy, who writes the blog This is Framingham (www.thisisframingham.com), called the old design “awesome” and said she misses it. “Parking was on the outside,” she said. “On the inside, you didn’t have to worry about getting hit by a car because it was all pedestrian. The parking lot in the middle thing is just wrong in all sorts of ways. It’s dangerous, it’s inconvenient. It’s an ocean of parking. Patrick Reffett, Natick’s director of community development, lauded the smart-growth approach, but called the development of cross-highway buildings colossally expensive, and said some of the regional plans probably will not come to pass within his lifetime. “Although they may seem like long shots, you’re looking at what the most beneficial design would be,” said Megan Jop, planning director in Wellesley.